We asked that simple question, and your overwhelming answer was just as simple — because they give so much love and joy. They may beg for a treat or two, but that’s a small price to pay for good-morning kisses, romps in the mountains, walks in the park or cuddles on the couch. Our days were brightened by the adorable photos and stories you shared. Now it’s our turn to spread the love! 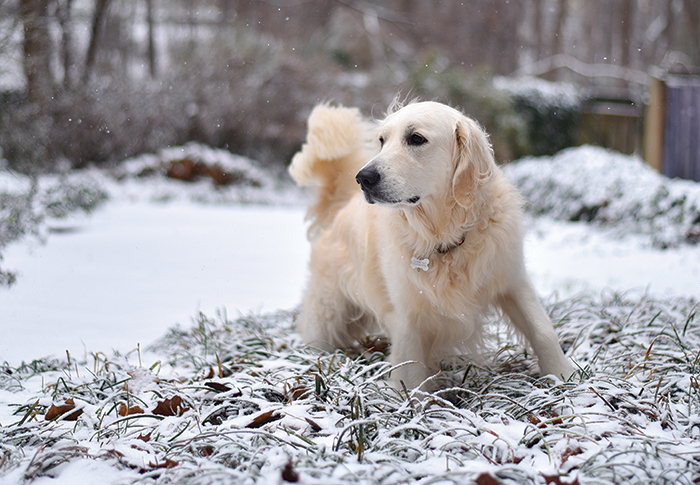 Milo, our British golden retriever, is a hero! 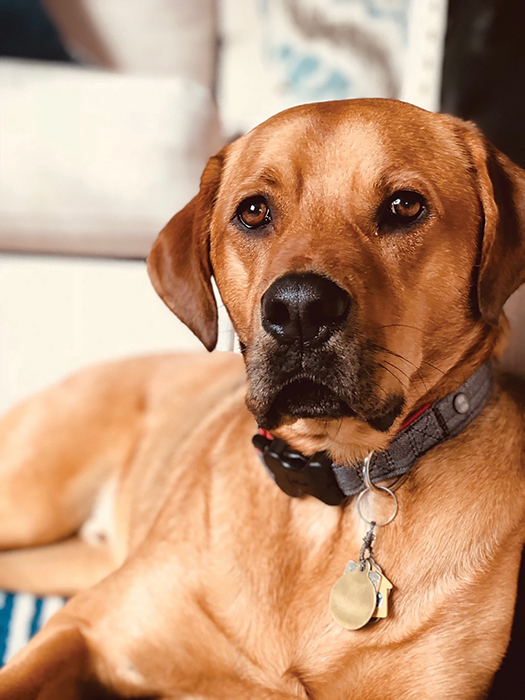 He is one of 3,000 goldens enrolled in the Morris Animal Foundation “Golden Retriever Lifetime Study” — the largest, most comprehensive canine health study in the United States. The study’s purpose is to identify the nutritional, environmental, lifestyle and genetic risk factors for cancer and other diseases in dogs. 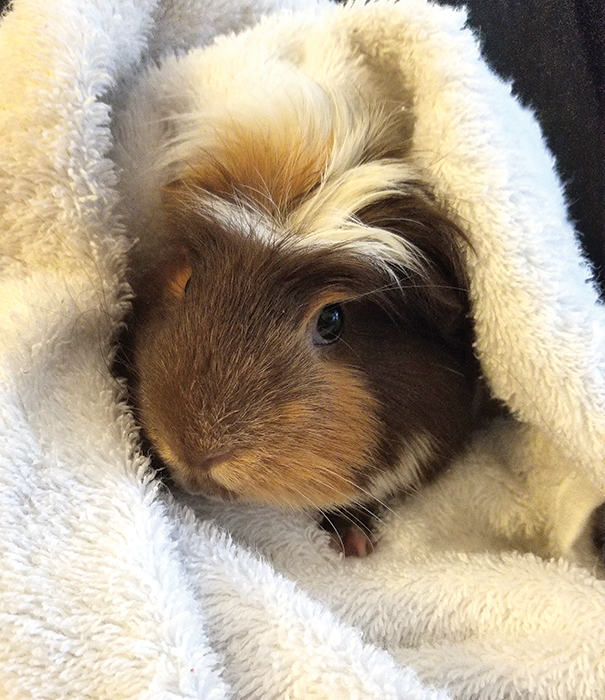 My guinea pig, Pippi is the best companion. When I get home from work she immediately starts squeaking to say, “Hi.” I am a teacher, and she regularly tries to eat my students’ lab reports. They laugh when they get a paper back with little chew marks. What makes Reuben so special is how smart, loving and expressive he is. 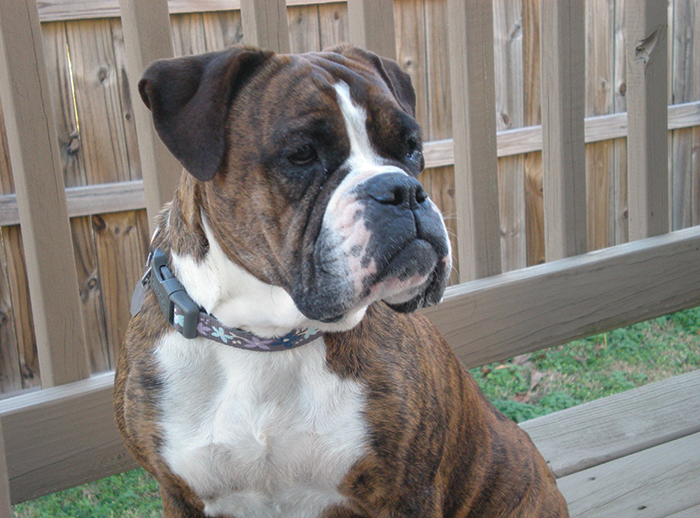 Reuben was a wonderful therapy dog for my dad when he was living with us in his final months. 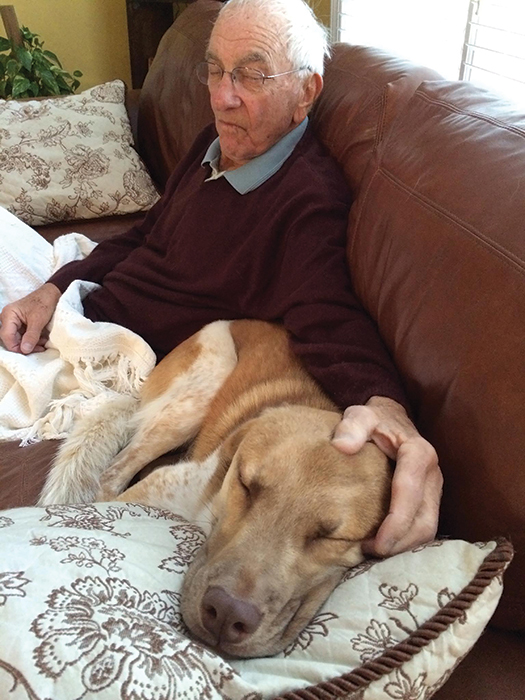 Reuben’s companionship brought him joy every day. He certainly brings us joy. He loves riding with us in my husband’s convertible, and he makes sure I get my exercise every day! Pixie is a retired racing greyhound. 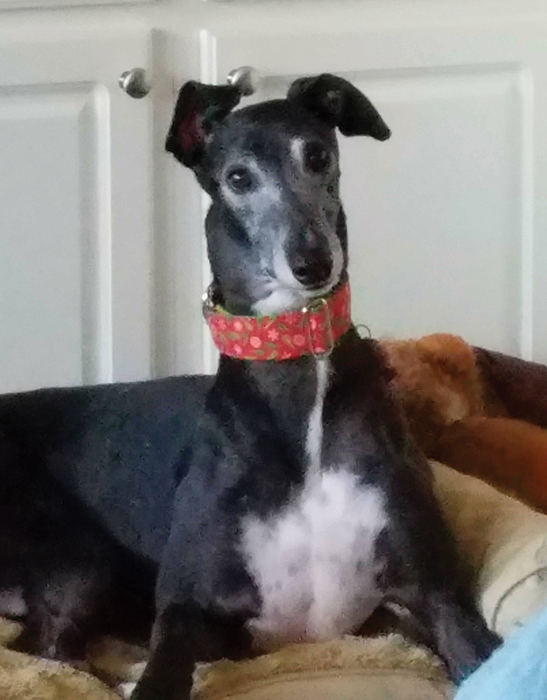 I adopted her through Greyhound Friends of North Carolina in Oak Ridge, N.C. She is a perky, playful girl who has brought “greyt” joy to my life. 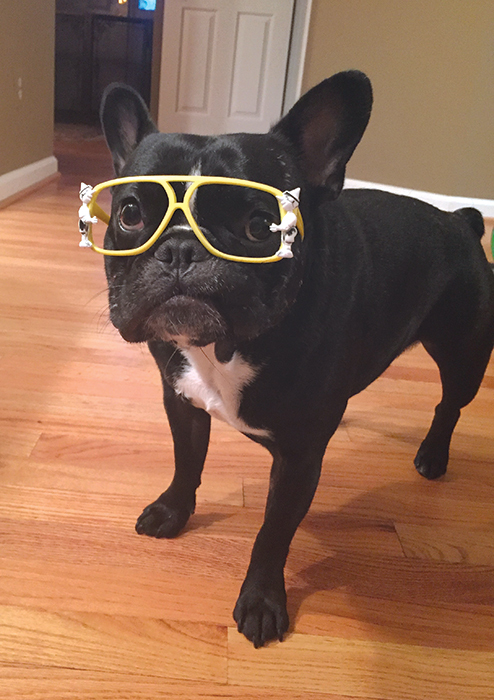 Our lives changed for the better when our French bulldog entered our family three years ago. Even though he has a love-hate relationship with his Frenchie sister, Zoe, he has been a joy to have in our family. Our 2-year-old daughter loves to throw the ball for him. He is the happiest when he is snuggling up close to someone or playing outside. Sevie is a rescue pup that we adopted when he was 10 weeks old. He is named Sevie because he is the seventh child in a family of six kids. He loves to sneak under the covers and sleep in bed with us with his tail sticking out. He will lay down and roll over for a belly scratch as soon as he hears the word “down,” and he loves to give lots of kisses. Fozzy is curious about everything! He’s also very much a lap dog. If there is a lap to be found, he is in it, until something outside gets his attention and he runs out the doggy door to protect us. What a wonderful addition to our family. 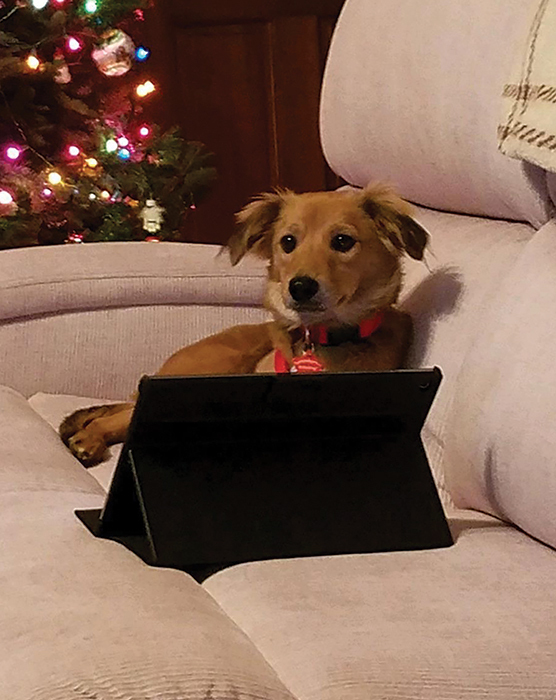 We were the lucky ones when we found him at Second Chance Pet Adoptions in 2016. What makes Buddy great? It’s the way we start each morning once I get him out of bed. He loves to snuggle so it can take a while, but then you get the look from those brown eyes and all you can do is smile. The joy he brings into our lives on a daily basis cannot be measured with words; it’s all about the moments. 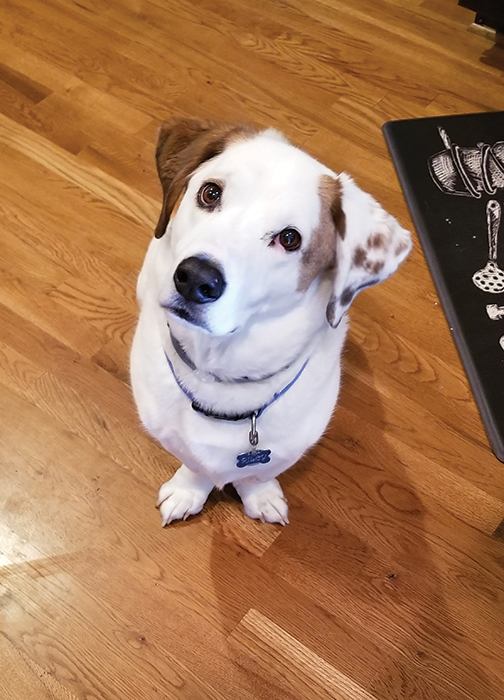 It’s his reaction from getting a new toy or his long stare when asking for his evening treat. Buddy is beyond great for so many reasons, most of all, because of the love and happiness he brings into our lives. What makes your pet great? 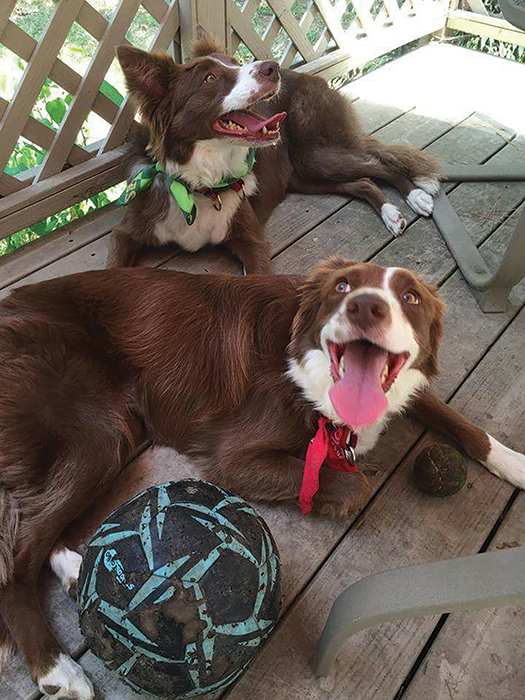 They are Border Collies — ‘nuff said. They are the greatest athletes ever, able to jump over a car to catch a Frisbee. They are also obedient and smart. I need to buy sheep, but they are against the HOA ordinances. 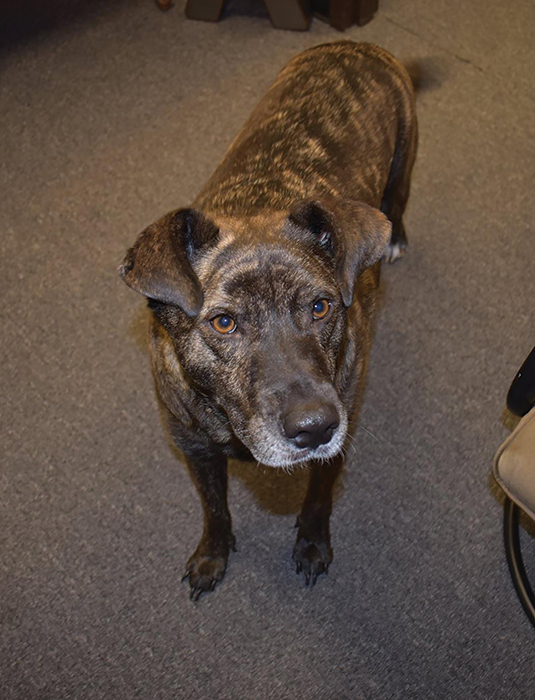 Milo is the morale booster at Aware Senior Care’s offices in Cary. 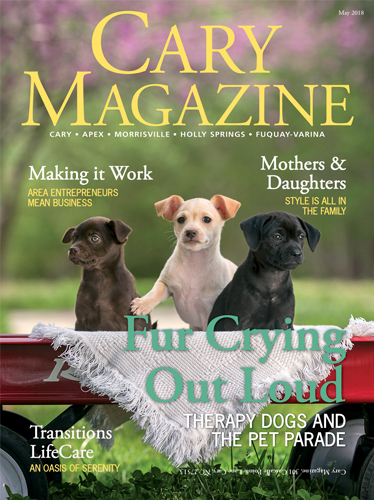 The caregiving business can be stressful, but his warm smile, wagging tail and soft brindle fur are always ready to help clients, visitors and employees feel better. Whenever emergency vehicles from Western Wake go by with their sirens on, he tries to imitate them with a low howl. This has earned him the nickname “Miloooooooooo” by the staff. He even has his own name tag! “The Girls” are not only sweet, loving, beautiful, and highly intelligent, but they are also social butterflies! 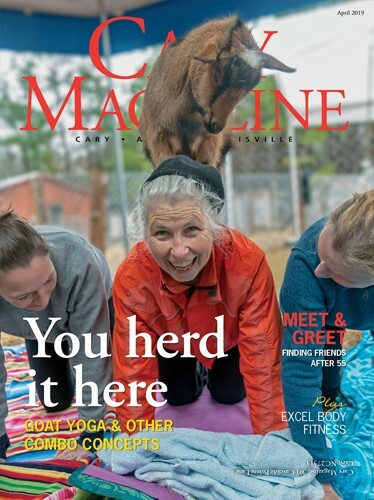 As original co-founders of the Triangle Westie Clan, you will likely see them around the Triangle at local bars, restaurants, dog-friendly establishments or on Instagram @Dylan_Sadie_Westies. 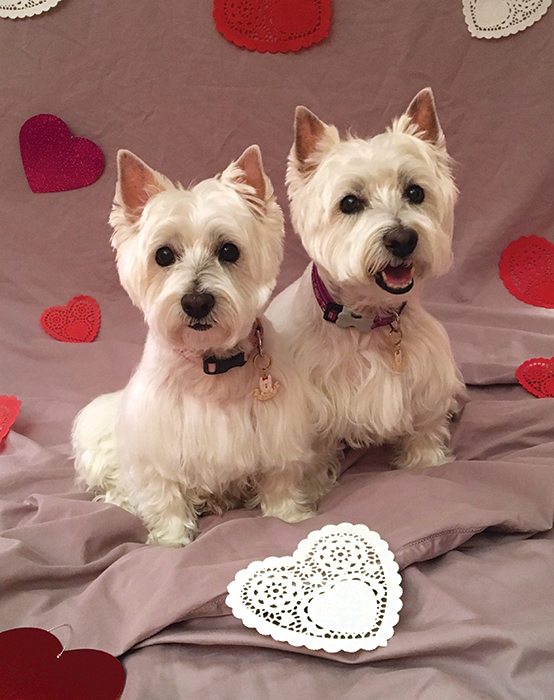 The one trait that cannot be denied is their endearing “Westietude” — a sassy, tenacious, fiercely loyal attitude that makes it clear who really rules the roost. 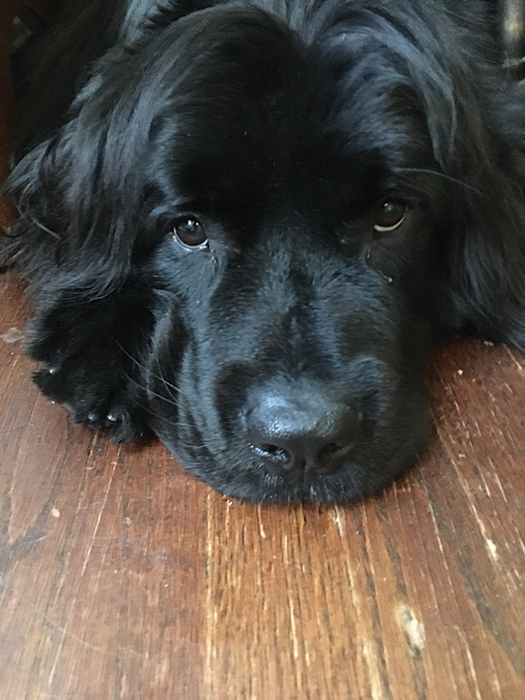 Yogi Bear the Newfoundland has never met a stranger. When you meet Yogi it’s like hugging your favorite teddy bear — only this bear barks and licks the people he loves! His favorite sport is football; he will take a football and run outside with it! His favorite treats are raw carrots and peanut butter. He makes a scene wherever he goes with his handsome stature and lovable spirit! 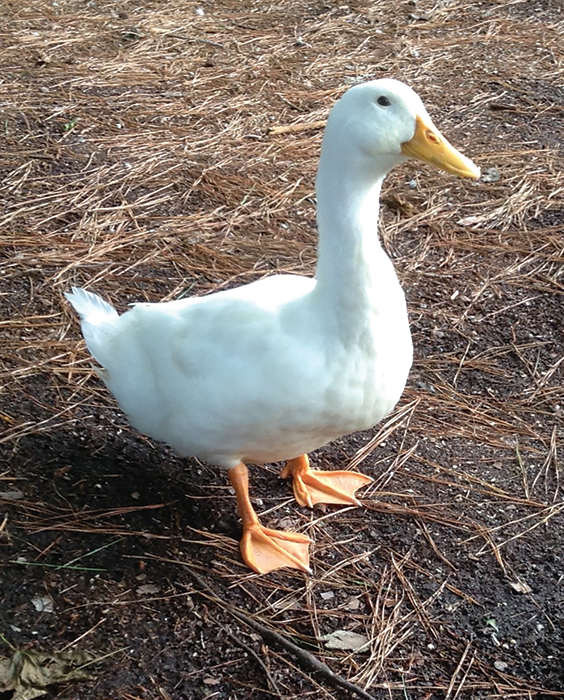 Miss Emily Duck is very brave and sweet. She survived a horrible hail storm we had here in Fuquay. After the storm she waddled out of the yard and joined our neighbors who were talking about the storm and started quacking as if to join in the conversation. 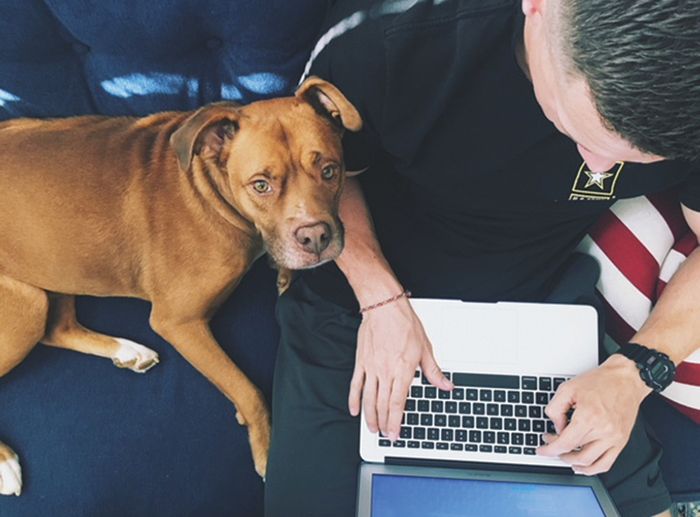 Butter Cup, a boxer/Old English bulldog mix, is a rescue dog and loves me so much — almost as much as I love her. The first thing she did when I got her was dig in one of my large houseplants. I caught her in the act, and told her, “No!” She looked at me, turned right back around and kept on digging. There was dirt flying everywhere, and I could barely keep myself from laughing. She is the biggest ham ever, always making me smile and laugh — no matter what kind of day I am having. 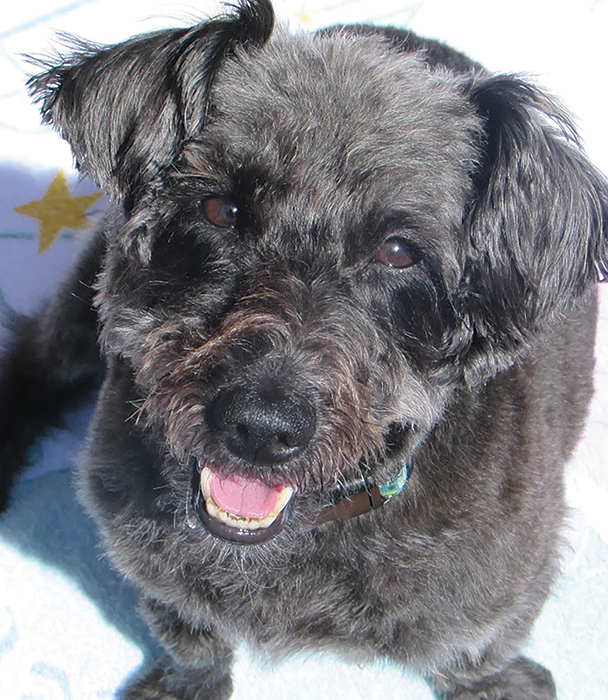 Riley was rescued from a shelter when he was surrendered by his previous owners at 2 and a half years old. 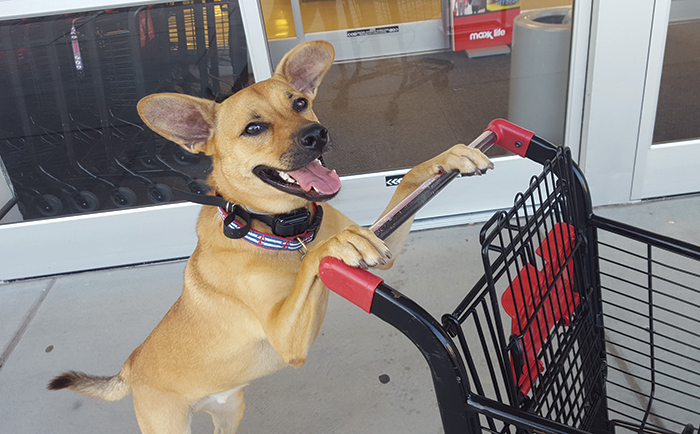 We saw Riley looking sad in his kennel, and when we took him out to play, it was love at first sight. Riley loves giving kisses in the morning and greeting the mail lady, UPS man and the children as they come off the school bus. He came to us a little broken and scared, but he has been the best, most loyal dog we’ve ever had. Riley has truly changed our lives. 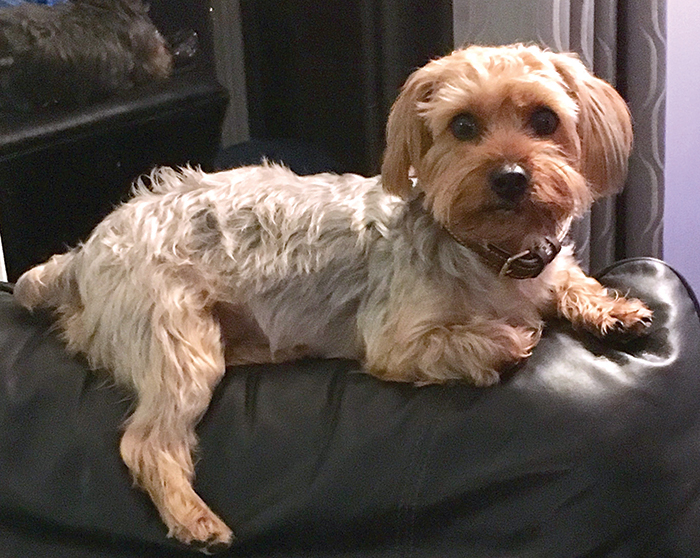 Kaylee was abandoned as a puppy and hit by a car. She has a plate in her pelvis and wire in her legs. 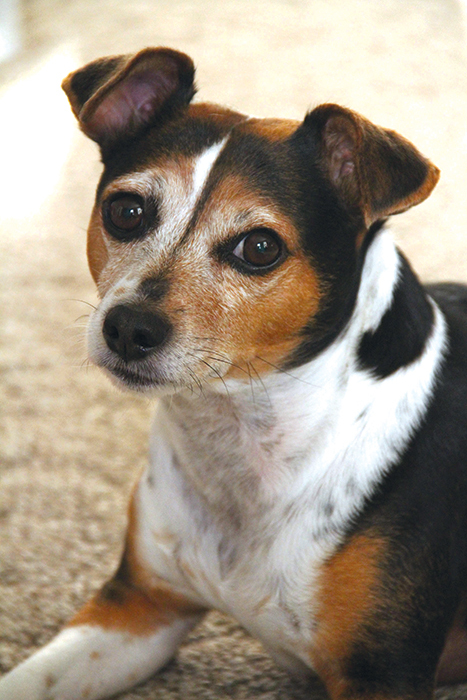 Pawfect Match Rescue and Rehabilitation cared for her after her accident and coordinated her care. She was restricted to thirty steps a day for two months during recovery. She was given the all-clear three days before Christmas and came home with us that day. Happily, she has now fully recovered. My cat, Oreo Cookie, is such a beautiful boy. At night he will sleep right up next to me. If I have my hand there palm side up, he will place his head in it and kiss my hand. 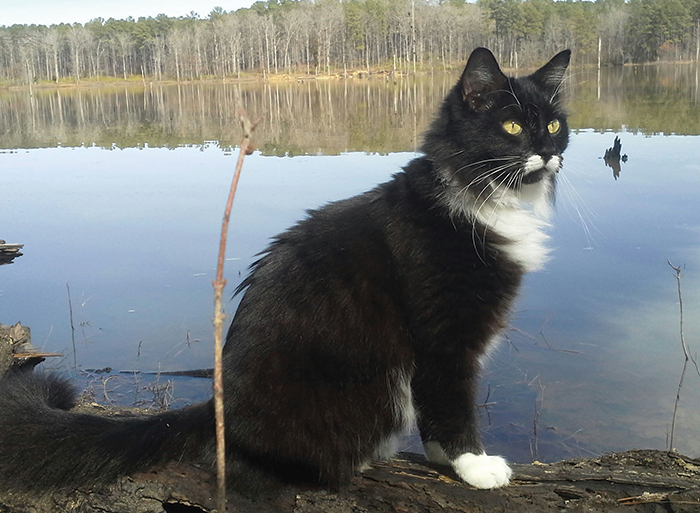 Oreo and the other cats go for walks in the woods with me. This shot was taken at Jordan Lake. Five years ago, I found my forever home with that lady human, after meeting her at the treat place (Petco). I’m a pretty curious guy, and if you’ve ever seen me out, you know I’m friendly. 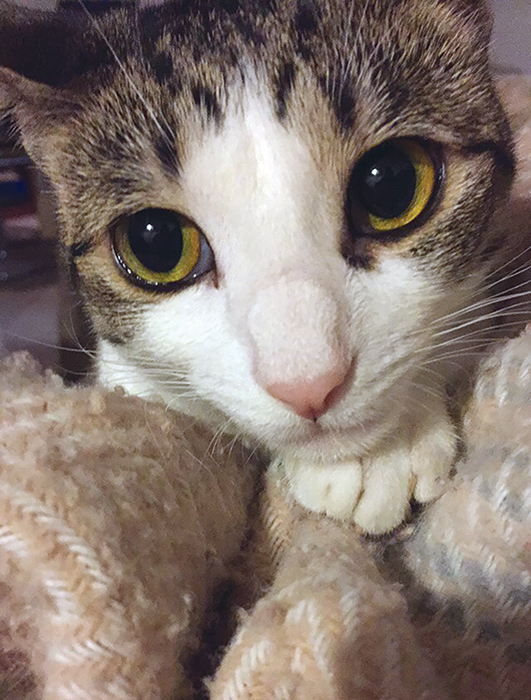 When people first see me, they are intimidated by my big head, but then I swoon them with my pretty eyes. I like short walks, long naps and field trips, and I will do anything for food. Cosmo is a great dog for the love and support he gives our family. We rescued Cosmo from the SPCA of Wake County when he was a year old. He has so much energy all the time and loves to eat dog treats! He loves to be a “burrito,” with a blanket wrapped around him. Although he may act like a tough dog with all his barks, he is such a sweetheart. 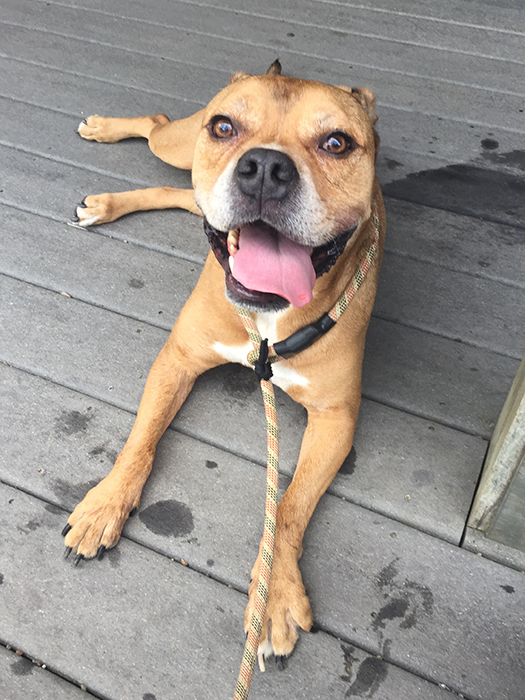 Luke is a gentle bull-in-a-china-shop that loves to cuddle. He is half pit bull-half boxer, and many people are scared of him by the way he looks. He is the kindest, sweetest pup you’ll ever meet. Hopefully those who meet dogs that look like Luke can start to believe not all pits are dangerous. You can tell by his teeth (the few he has) and his anxious nature, that he had a hard time before being adopted. Anyone can see how much he loves being loved by his new family.